Last spring, I taught a section of conceptual chemisty. Brand new subject for me. To make my life easier, I initially told the students that I would be using the same points-based grading system as their teacher from the fall semester. And then I sat down to grade their first quiz. How many points was each question worth? Should some questions be worth more than others? How many points in total? How should I give partial credit? 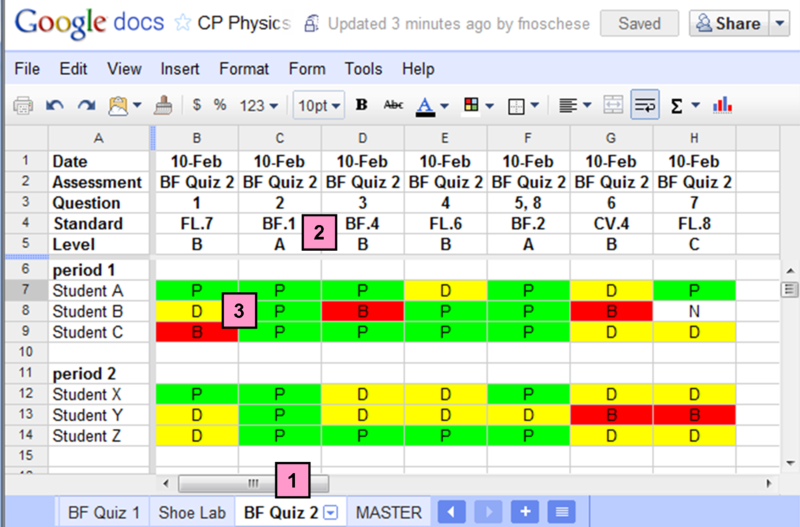 And how is any of this providing helpful feedback to students? A set of ~5 standards per unit. WHY: This seems to get at the right scope–not too granular, not too broad. Of course, some units had a few more standards, others a few less. Keep it simple. Each standard was graded binary YES/NO. WHY: Prevents point-grubbing from students. No need to deal with questions like, “Why did she get a 3 on that standard while I only got 2?” Either the student met the standard or they didn’t. Keep it simple. Standards that are YES cannot go back down. WHY: Prevents students from perceiving this new grading system as unfair. This can save you many headaches, frantic emails from students, and phone calls from parents. Keep it simple. Term grade = 50 + 50*(#YES/#TOTAL). WHY: No need to worry about conjunctive grading systems, decaying averages, or tiered standards. Kids can quickly and easily calculate their grade. Keep it simple. 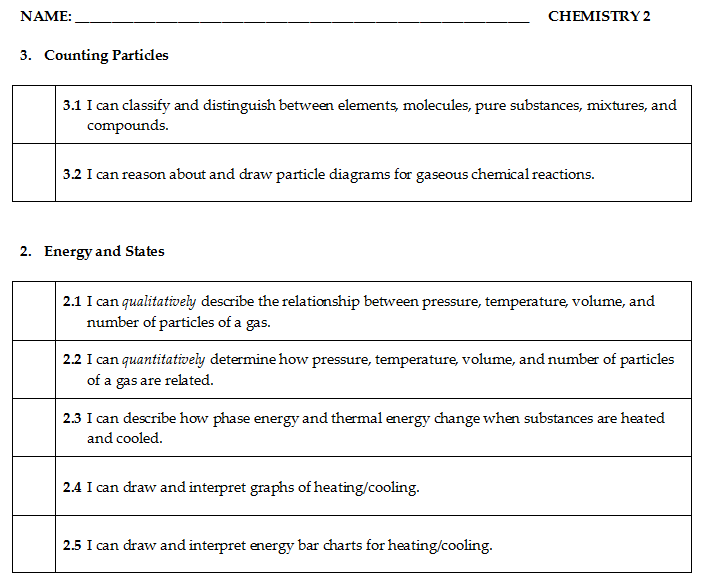 I didn’t write the standards on each quiz, but put them on a separate scoring sheet (see below). As I looked over the quiz, I marked “✔” or “X” for each standard. 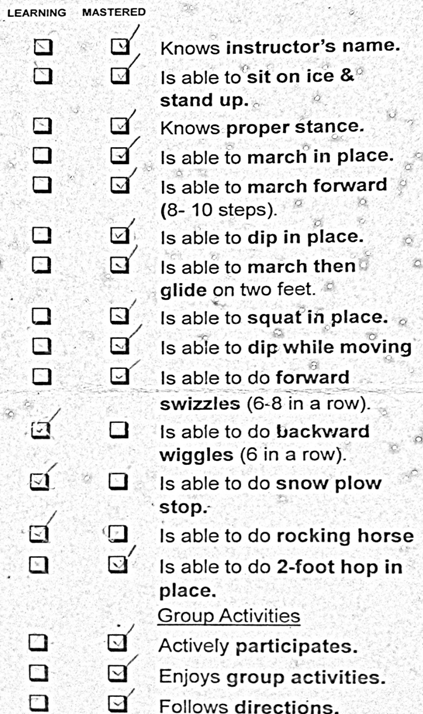 When I finished marking all the quizzes, I used the score sheets to transfer the grades into ActiveGrade. After all the scores were entered, I printed a current grade report for each student. I stapled together the quiz, the score sheet, and the grade report so each student would know where they stood when I returned the quizzes. That way, if the score sheet showed that student “went down” in a standard they previously had correct, they were reassured by the grade report that the YES grade from a previous quiz remained on record. No worrying about logging into ActiveGrade after school or during class. 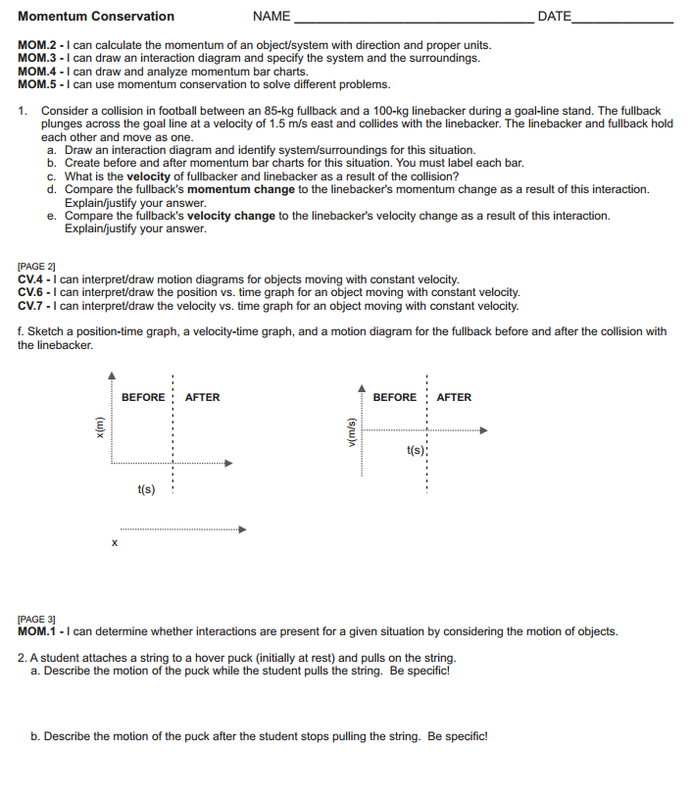 Keep it simple for the student. At the end of each term was one final quiz to show understanding any unattained standards. 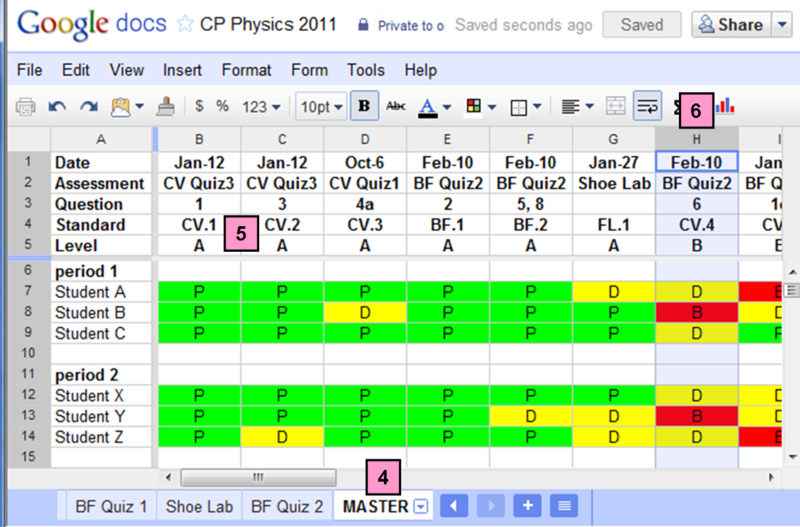 One final bit of advice: If you still want to grade HW, binder organization, class participation, etc, go right ahead. The best part of SBG, in my opinion, is that it gives multiple chances to be successful, gives better feedback about what students can/cannot do, and forces the teacher to spiral the curriculum to enable reassessment. I don’t want you to forgo all those SBG benefits because you still feel uneasy about giving up grading HW completion. Baby steps, baby steps. Could my system have been better? Sure. But don’t let perfect be the enemy of good. You can tweak and modify next year. Keep it simple, and just do it. Today’s xkcd comic nails the problem with averaging customer ratings. The connection to grading is pretty obvious. 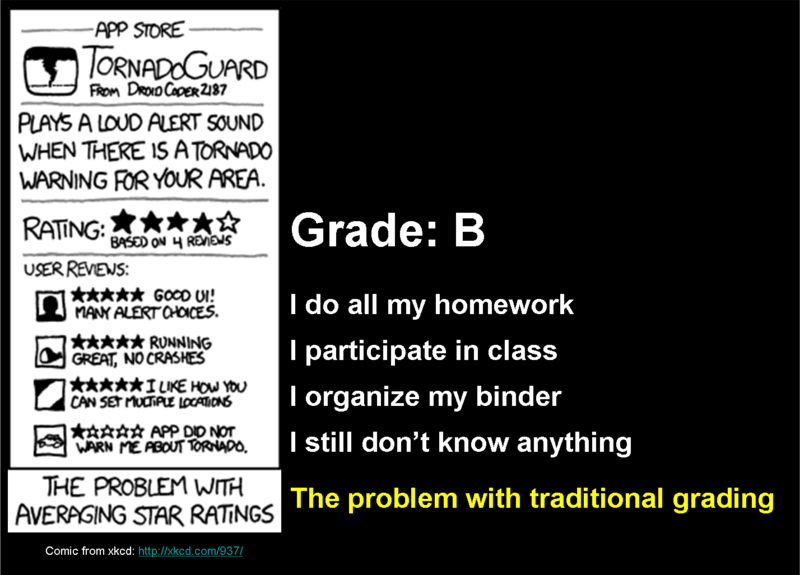 And do we really need anymore reasons to convince people we need to switch to Standards-Based Grading?